All three lines of stitching in, and I pulled them up to cinch it--couldn't resist seeing the effect. What neat little pleats they be!!! Now I just need to figure out how to attach this massively heavy skirt to my bodice. According to most informative site I've read (Ren Tailor) you have to attach right sides of skirt and FINISHED bodice together. So I guess I have to finish the bodice boning/bottom first... I wonder if its possible to attach the skirt to lining and interlining only and then try to do a cleaner finish between the outer layer of bodice fabric and skirt? I may have to play around a bit. 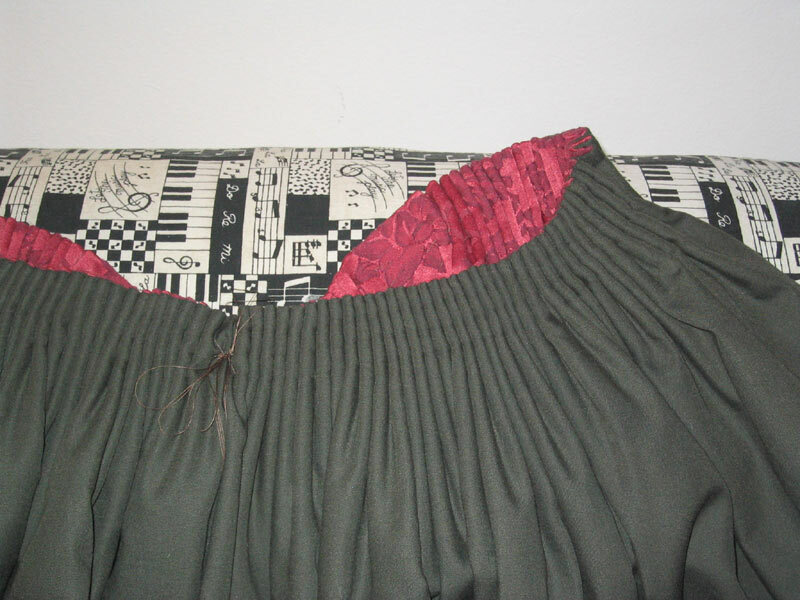 Also, I wanted to steal beth's ideal and do some utility loops around the bodice/skirt seam for attaching useful items--may i ask if there are any tips/tricks to this, dear? Very lovely. I am all for pockets. Mmmmm......pockets ain't period. Digging around in your pockets ain't period. So long as you can refrain from digging around in your pockets looking for stuff, it'd be handy. On the other hand, little pouches are utilitarian *and* pretty. Utility loops rock. I added mine after the fact actually, by just carefully working the loop (soutache braid I think it was?) 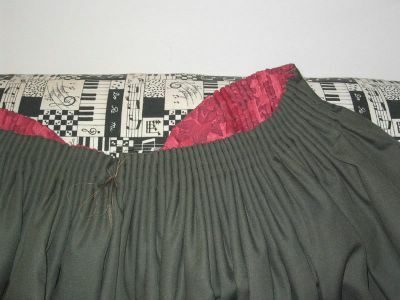 up between the stitches where I'd hand-attached the skirt to the bodice. I put a couple of knots in the soutache braid to give myself something easy to stitch in, then stitched the heck out of it to the...umm.....bodice I guess? I'd have to look. Lots of thread at any rate. I think there'd be a way to put them there in advance, but I guess it depends on how the pleated skirt is getting attached exactly.